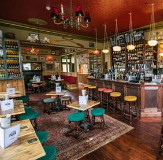 In the peaceful outskirts of the city, behind Brighton’s vast Preston Park, stands the charming Preston Park Tavern. Expect excellent cask and bottled beers from around the world, a discerning selection of wine and an open plan kitchen serving knock-out food all day until 10pm. They’ve an impressive menu boasting one of Brighton’s best burgers – home made and served in a brioche bun, as all good burgers should be! There’s also a fabulous little kids menu that’s just perfect for nippers and enough space for everyone to enjoy themselves. The beautiful garden welcomes alfresco drinking and dining when the British summertime graces us with its presence. And during winter, head inside and sit around the wood burner.